It’s Seafair Fleet Week here in Seattle, and the annual “Parade of Ships” went past my downtown office window this afternoon. Inspired by all those big boats on Elliott Bay, I went looking for a nice set of cool LEGO ships, and quickly found these beauties by Rancorbait. 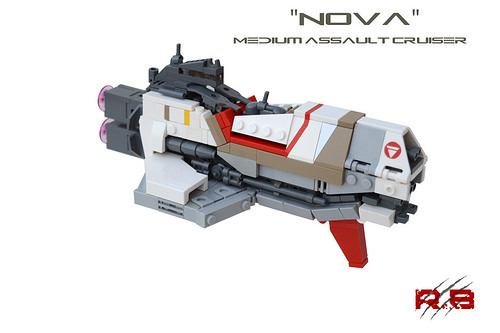 First up, the “Nova” Medium Assault Cruiser incorporates great brick-built striping and a sporty red fin. 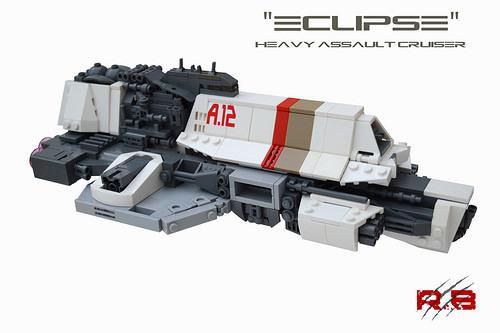 The “Eclipse” Heavy Assault Cruiser is very obviously part of the same fleet, with a consistent design aesthetic, though the Eclipse is a bit larger and has significantly more greebles. The bridge overhanging the white section is an excellent touch. 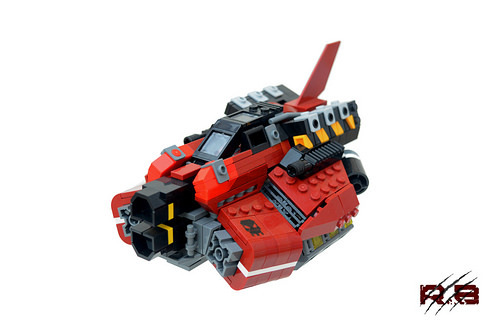 Finally, though it’s a different scale and certainly isn’t part of the same fleet, I can’t help but love this big red “Warthog” gunship. There are just so many non-right angles all over this thing!